The Castle is open for tours and the gift shop is now open again. (305) 248-6345 or send Laura an email with your group information to lauramaye@coralcastle.com. The Coral Castle is available as a venue for all kinds of events – from birthday parties to family reunions. Our unique setting guarantees an event that will be remembered for years to come. Venue is available on a first come first served basis and therefore cannot be confirmed without a signed contract and deposit. For additional information please contact Laura Maye at (305) 248-6345 or send Laura an email with your group information to lauramaye@coralcastle.com. From the Northwest: – There are two choices. Take I-75 also called US 41, South, to Exit 39, merging onto the Florida Turnpike. To Exit # 5, called Biscayne Drive (288th Street). 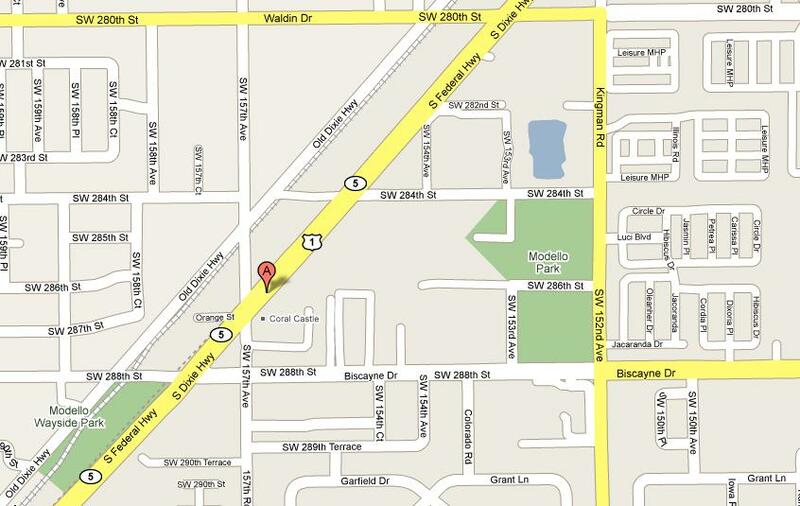 Make a right turn on Biscayne Drive going West for about 2 miles to SW 157th Avenue. Make a right turn on SW 157th Avenue. Coral Castle’s entrance will be on the North side before US1. merging onto US 27 also called Okeechobee Road. Make a right which will take you North for a moment. Next, make a Left on Krome Avenue (997) going South to Homestead. Turn left on 288th Street going East, and proceed to SW 157th Avenue. Make a left turn on SW 157th Avenue. The Coral Castle entrance on the right side. From Naples, proceed East on Tamiami Trail also called 8th Street to Krome Avenue, (997), going South to Homestead. Continue to SW 288th Street (Biscayne Drive). Turn left and proceed East to SW 157th Avenue. Make a left turn onto SW 157th Avenue. The Coral Castle’s entrance is on the right side. Take I95 South to 836 West to the Florida Turnpike South. to Exit #5 Biscayne Drive (288th Street). Make a Right onto Biscayne Drive. Continue West for 2 miles to SW 157th Avenue. Turn right on SW 157th Avenue. Take I95 South to the Florida Turnpike South. Take the Florida Turnpike, past the Homested Extension, to Exit #5 Biscayne Drive (288th Street). Turn right going West, onto Biscayne Drive. Next, continue for 2 miles to SW 157th Avenue. Make a right turn onto SW 157th Avenue. Go North on US Highway 1, turn right onto SW 157th Avenue. The Coral Castle’s entrance is on the left. Merge onto the Florida Turnpike South. Continue past the Homestead Extension, to Exit #5 Biscayne Drive (288th Street). Continue West to the Florida Turnpike South. to Exit #5, called Biscayne Drive (288th Street). Continue for 2 miles to SW 157th Avenue. Turn right onto SW 157th Avenue. merge into 836 West (Dolphin Expressway). Take the Florida Turnpike South past the Homestead Extension, to Exit #5, called Biscayne Drive (288th Street).